Finally… here you have my two children playing with Eulerian graphs! They are lovely! Aren’t they? 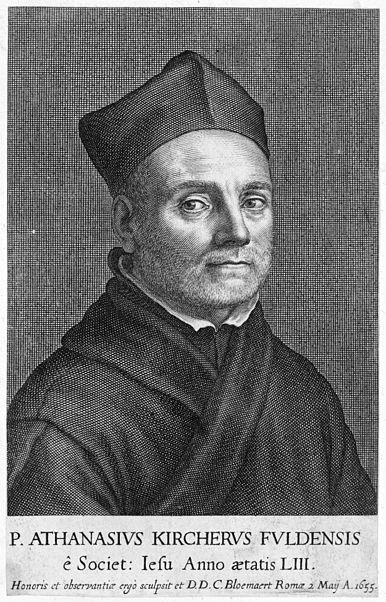 Organum Mathematicum was invented in 1661 by the Jesuit astronomer and mathematician Athanasius Kircher. This device is a comprehensive portable encyclopedia and is designed for the following disciplines: arithmetic, geometry, fortifications, chronology, gnomonics (sundials), astronomy, astrology, steganography (encoding) and music. The case contains tables for calculations without ‘tiring the mind’. Each of the nine disciplines contains 24 flat boards of different colours, with definitions and information. Finally, different slide rules fill some drawers. You must be very patient and it’s a pity that this museum isn’t located in a larger building. I have more pictures but you must go there if you want to have a real idea of the exhibition. It’s impossible to summarize it in some photos! Each row, each column and each diagonal have the same sum! I must finished this wonderful walk for the calculating machines going downstairs to the groundfloor again and showing some instruments more. Number 41 is a calculating machine from c.1955 made by Bell Punch Company Limited and number 42 is the ‘Eckel dial rule’ from the same year. The calculator number 51 is from 1955-1965. The groundfloor of the Science Museum is full of technical and scientific objects which change our world in the last centuries and we find some mathematical objects (of course!). For example, we can see some slide rules: Fuller’s slide rule from 1890 (nr.25), Boucher circular rule from c.1885 (nr.26), a celluloid slide rule for triangle-mesh-reinforced concrete slabs from c.1912 (nr.27) and an engineer’s combination rule from c.1870 (nr.28). Object number 1 is a proportional compass meanwhile number 5 is a ruler with pencil and dividers and number 6 is a slide rule. Oriental abacuses use beads on rods to represent numbers. Addition and substraction can be quickly performed by flicking the beads to and fro. Rather than ten beads in each column, the Chinese abacus uses five ‘unit’ beads and two ‘five’ beads (1 and 2). The Japanese abacus has just four ‘unit’ beads and one ‘five’ in each column (3).